This is the story of Uncle Bikky, Chunmun and Duggu, the dog. Their illustrations are just as funny as their names. 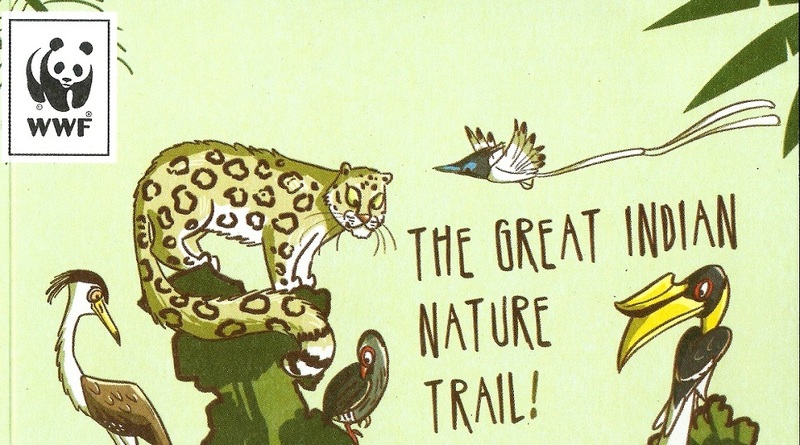 As the three set off on a wildlife adventure trail, your heart bounds along with them. It’s an exciting journey that stretches across 16 chapters. Each chapter has well-researched content accompanied by simple and beautiful illustrations. As you turn the pages, your imagination travels from one adventure to another. 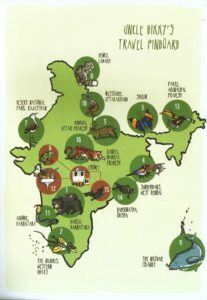 It begins with the Piggyback Bear in Daroji, Karnataka, and moves on to the Flying Dragon in the Nilgiris, Western Ghats, More than just a Dead Leaf (a mesmerizing leaf-shaped Orange Oak Butterfly) in Sikkim, Boat-Birding in Tigerland, Sunderbans, West Bengal, The Terai from a Watchtower, Dudhwa, Uttar Pradesh, A Backyard Surprise at Uncle Bikky’s Home, No Drought in this Desert, Desert National Park, Ghost Cat, Hemis, Ladakh, Treasure Island – The Nicobar Islands, Quail Trail, Mussoorie, Uttarakhand, In the King’s Lair, Agumbe, Karnataka, Bird Bath Matinee, Superdad – Pakke, Arunachal Pradesh, Olives by the Beach – Gahrimatha, Odisha, City by the Night, Stripes in the Meadows – Kanha, Madhya Pradesh. Every experience is vividly captured. It helps you gain an in-depth understanding of the species and the terrain they live in. 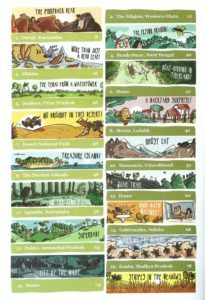 There are several interesting sections like fun facts about wildlife and their terrain, trivia, activities, puzzles, quizzes and a page for notes at end of every chapter. 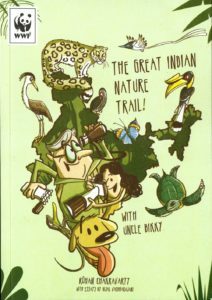 It’s a very useful and interesting book for kids, nature-lovers, budding wildlife photographers and enthusiasts.